From the moment Daguerre produced his first pictures in the late 1830s, people have argued about the relationship of photography to art. “Artistic Photography” was a common line on photography studio advertising, often accompanied by some form of an image of an artist’s paint palette. “While the camera produces nature truthfully–perhaps too much so for mortal vanity in general–the artist’s office is to impart life and color” (How to Paint Photographs, 22). The goal, wrote Ayres, was the harmonious “union of the true and the beautiful” (How to Paint Photographs, 23). In this formulation, art and photography are not rivals but partners. Photographs reproduce nature, but artistic embellishment brings nature to life. Many studios employed staff whose job was to add color to photographs. This could range from a subtle hint of rose to the lips to a full-scale reworking of the photo into a drawing. 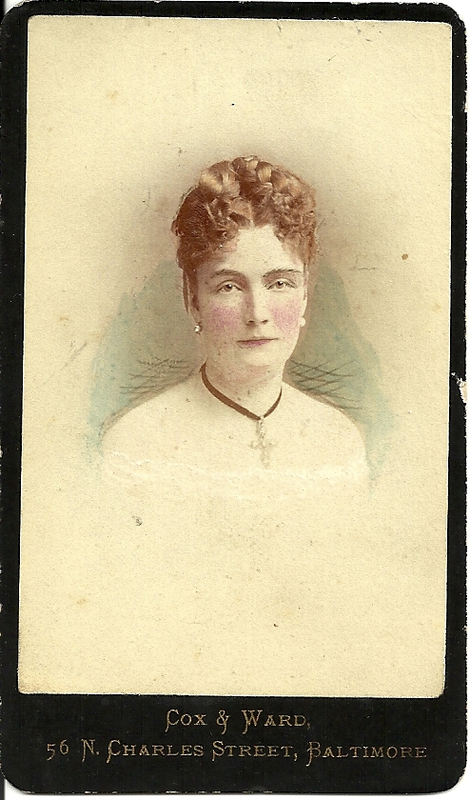 This carte de visite from the Cox & Ward studio is an excellent example of the latter treatment. Watercolors, pencil, and crayon (now known as pastels) have been used to alter the figure’s features until very little of the original photograph can be discerned. The unidentified subject appears to be in evening dress. She wears her auburn hair in shining braids piled high on top of her head, with frizzed curls on the forehead, a style in keeping with 1870s fashion. A cross on a black velvet ribbon draws attention to her creamy throat and shoulders. Bringing out the black of the subject’s choker, the black card mount is gilt-edged to match the gilt type in which the studio name and address is printed. William A. Cox operated a studio with a partner named Ward–possibly a jeweler named George W. Ward– from 1870 to 1881. Cox and his family also spent time in St. Augustine, Florida, where they are found in the 1885 Florida census. He may have located there permanently by 1900. A William A. Cox died in Broward County, Florida in 1915.